Before 1950 there was still a British Grand Prix it just wasn’t as regulated or part of a proper global competition. It was held at the legendary Brooklands. Brooklands is sadly no longer with us. It was used for fighter craft production as the site was also an aerodrome in the Second world war and abandoned to the elements. It featured famously banked curves and had short to long range distance and timed races. After the Second World War many aerodromes found themselves to be very much redundant. A new use was found for one particular aerodrome this was Silverstone in the Midlands. It became a race track. It, along with the Aintree course were the home of the British Grand Prix until 1954. 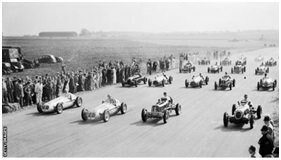 The British Grand Prix was the first ever to be held of the modern era and its first event was at Silverstone. The track proved a roaring success, it was fast and aided overtaking. However, Silverstone was not the only place to host the race. On odd numbered years the race was undertaken at Aintree, also the site of the Grand National Horse race and still used today but in more modest events. This lasted until 1963 when the alternative duties were held by the south east circuit of Brand Hatch. This started in 1968 with Silverstone taking on the odd numbered years. Brands and Silverstone shared duties until it became clear that with the development of new cars tracks like Aintree and Brands were too small, although well loved by the drivers. The answer was clear that only Silverstone had the ability and space to carry the event forward as it could be modified. This disappointed the drivers as the track had hardly changed since its first days in the late 1940’s. All the same with changing cars the track needed to test them more strenuously plus provide better and safe driving conditions for the drivers. This started in 1987 but it was clear that more would be needed. The tragic deaths of Ayrton Senna and Roland Ratzenberger in 1994 cemented the need and the track was transformed over the years into the testing but less fast and safer track it is today.